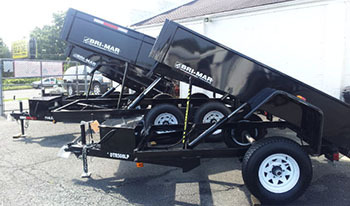 We sell BRI-MAR and BEWISE Utility Trailers at Restless Wheels. We offer the best prices in the area on our utility trailers. We service, repair and can custom outfit your trailer for your needs. We can also special order a wide variety of customized dump, enclosed, and utility trailers. Browse our website gallery to see samples of what is available or come in and experience our family atmosphere and professional, knowledgeable staff that are here to help you with any questions. Let us know how you are going to use the utility trailer and we will make sure you get the right one for your job. You can also reach us on-line. We are a full-service trailer dealership including hitches and trailer parts. We offer competitive pricing on quality products and services. Heavy Duty Gooseneck Dump Trailer w/ Solid Highsides.